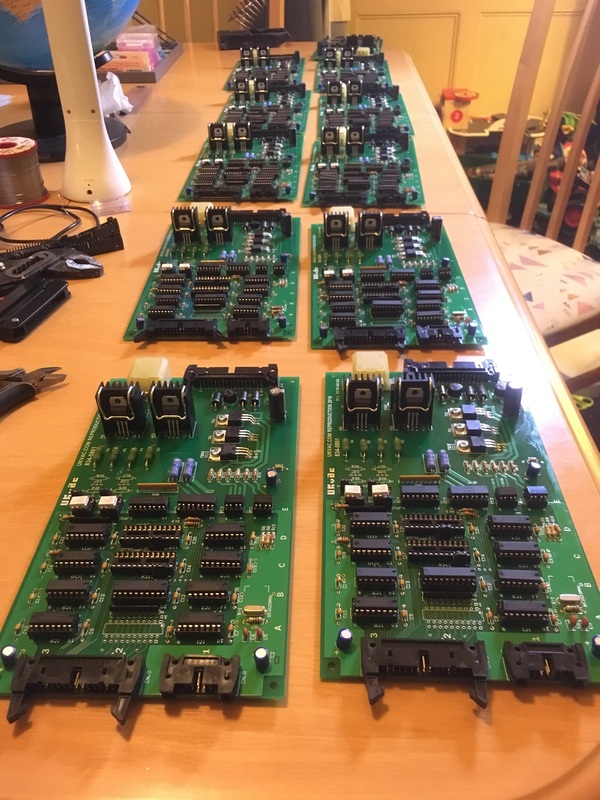 Outrun/Space Harrier DLX Compatible Motor PCBs. 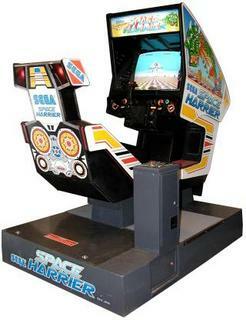 Quote Reply Topic: Outrun/Space Harrier DLX Compatible Motor PCBs. We have now sold all of our motor drive PCBs!! We will consider more if there is significant interest, but the costs will likely increase a bit as they have proved more labour intensive than budgeted (and discounts on components won’t be so good for smaller batches). We also need a bit of a 'breather' to catch up as assembly and shipping has taken a bit longer than hoped, although the boards are being sent out. As you have probably seen in our development thread (please log-in), these are a reproduction of the triac-based motor drive PCB found in the two motorised cabinets. *Replicates the look and form of the original PCB closely in footprint, component layout and track routing. *Replicates the operation of the original PCB exactly, down to circuit level. (The board is supplied with modern components). *Dual-channel for use in either game. GAL's replicate either 3155160 or 3155160A PAL's via a jumper, to select the correct motor speed. *Open-source design with schematics and user manual (coming soon!). Customised 2.54mm pin headers are used in-place of the Amphenol 26 and 34 way I/O connectors as these are obsolete. This is intended to be a non-profit project for the enthusiasts, so the price is: £80 + postage. This is £58 for parts & box, £20 for assembly and test and a £2 margin. Should we make a profit (via bulk buying) after all orders are sent and dev parts covered, we will donate the money to UKVAC. Shipping costs abroad will vary on destination, although £13 is about an average. This is a hobbyist, non-commercial project and we do not offer a warranty, although we will do a basic test on each shipped unit and will try to help in the event of any issues. can't wait to see how popular this is. Feel privileged to have seen this in person. Can I take 4 please? But at that price I am in for two fully assembled please! Have you advertised on KLOV? I was thinking the same, it’s certainly underpriced for the effort and value it actually gives to a DLX cab. I’m sure you won’t have a problem making a few batches at this price point. But... I consider it an experiment in a group working together and my time is free - it's been fun and the payback is in people appreciating it and enjoying it (and hopefully volunteers for future projects). It could be an exercise in printing money, but I find it more satisfying to go the other way and deliberately NOT try to make money. Plus £80 eases the pain on anyone who has to add shipping to the distant countries on top of that. The one request/hope is that they're not flipped for profit. I can't imagine anyone on here doing it, but we'll be keeping an eye on that to undercut anyone who tries it . Having said all that, if assembly and test starts to remove people's will to live, we might have to up the assembly cost a little. There should be a KLOV thread appearing when my brother gets around to it (as he's on there a bit, living Stateside). Great price and awesome to see this project come to fruition. A nice bit of UKvac team work. I would personally try an approach similar to a lot of the vinyl record sellers. Sell the first batch at a nice reasonable rate then pop the price up slightly for the late comers. Also means you have more room to manoeuvre for any eBay flippers. If you go to expos and such, John, everyone should be buying you drinks. Can you put me down for one please? Great work! Great news! fantastic work mate, can I have one please. Do you think this pcb can work also in the Power Drift DLX ? I must mention Naoki and tin - my involvement in the PCB routing was minimal and the fact it looks so close to the original was driven by Naoki (and it turned out to be one of the most satisfying aspects). Bicton - no, sorry, it's different to the Power Drift board (itself something that could be done as a later project as we've got one to copy). Are you still interested in one? ...and I must therefore mention that my work in this was pretty minimal. I learned a lot and contributed a little as I was learning, so maximum props should be going to John and Naoki. Could I have 4 of this item, please? I'd like one, just to be safe in case my original is secretly being eaten by rodents living in my machine.